Join our Wroclaw Food Tour and experience the Polish cuisine as its best! WHAT IS THE TRADITIONAL POLISH FOOD TOUR? Getting a taste of authentic food is an important part of any holiday. If you want to experience a different culture, you need to get a taste of the local food and drink. While there is an overwhelming amount of information in guidebooks and online reviews, you might find that the best way to experience as many things as possible is to take a food tour. We invite you to join us and experience Polish and regional specialties while getting to know the city and culture. Known as the “Polish Venice,” Wroclaw is a beautiful city with a hip, young vibe. While the city has no shortage of places to eat, finding tasty, traditional Polish food can sometimes be a challenge. On our food and culture tour, you’ll get a chance to eat like a local while learning about Polish culture and history. We’ll take you to our favorite places around the city where you’ll get a chance to see a variety of places and taste a number of authentic dishes. 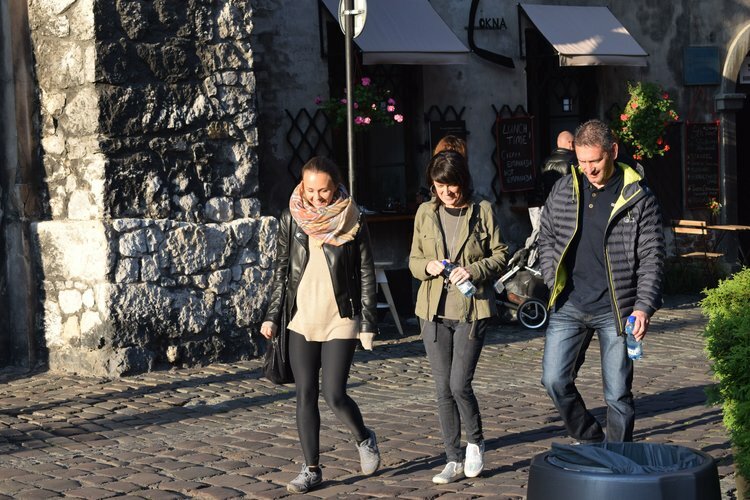 Our guides will share their knowledge as you walk and talk, and you’ll have the opportunity to visit 5 different locations where you will sample 12-14 dishes accompanied by Polish craft beer and vodka. We keep our tour sizes small, so everyone has an opportunity to interact, get to know each other, and ask questions. Make sure you arrive with an empty stomach—we promise you won’t leave this tour hungry! We look forward to meeting you and introducing you to our favorite Polish dishes! **Please arrive hungry, absolutely there is no need for lunch/before and dinner/after the tour. Guide – Each tour is led by a friendly guide, and we are eager to share some of the stories we learned at the feet of our parents and grandparents. We’re passionate and knowledgeable about food and food culture. Restaurants – We will visit 5 different establishments, and will have a chance to reflect on the atmosphere of each. You’ll be able to experience places where mostly locals hang out. Food – You will get to taste 12 to 14 different food items, and there will be dessert. That’s a lot of food – more than enough for lunch or dinner – so come hungry. Unless you have a superhuman appetite, you will be full by the end. Tips and Advice – Your guide will give you our foodie map, cookbook and some personalized recommendations for how to enjoy the rest of your stay. We will tell you about some more great local spots to visit for food, entertainment, and sightseeing. Summary – Each guest will get a summary of the tour to help you remember the places we have visited and the foods we have tried. We offer the tour in English. Tour in different languages available on request. The tour lasts app. 3h 30 min. We run private tours for smaller or larger groups. Just contact us to explain your needs, and we will do our very best to work with you. We can accommodate more than a group of 12 people on our tour. Please contact us if your group is larger than 10 people. If you have food allergies, we need to know. Please tell us about any allergies ahead of time. All places visited during the tour are within walking distance. The walking will be very manageable for most people. If you have mobility issues or are otherwise concerned about the walk, please talk to us about it ahead of time. When booking the tour, please make sure that your email address and phone number are correct. We need to be able to get in touch with you! Our food tour is scheduled during the afternoon (1 pm) and evening (5 pm). Please let us know which option suits you better. Payment should be done online.